Got some old tires on hand? Building a tire garden is easy! At the butterfly garden where I work, we use tire planters to grow host and nectar plants for our local butterflies. Stack your tires, being sure to keep the configuration stable. Fill with compost or potting soil and add some plants. Most people suggest avoiding edible plants, as trace chemicals from the tires could leak into the soil. Visit BirdsandBlooms.com for container planting ideas. Like any container, these will dry out more quickly than garden beds, so be sure to water as needed. Get more tire garden advice and how-to by clicking here. You can even paint the tires using appropriate outdoor paints (ask at your local home improvement store). This is a great project for kids, too. A friend of mine helped her children’s school decorate and install inexpensive tire planters as a way to spruce up the grounds and get the kids interested in gardening. No room on the ground? Smaller tires from trailers or wheelbarrows are great for hanging from trees or sturdily-mounted hooks. Paint them or leave them plant – whatever suits your own style. Choose trailing plants for hanging tire gardens for a dramatic look. 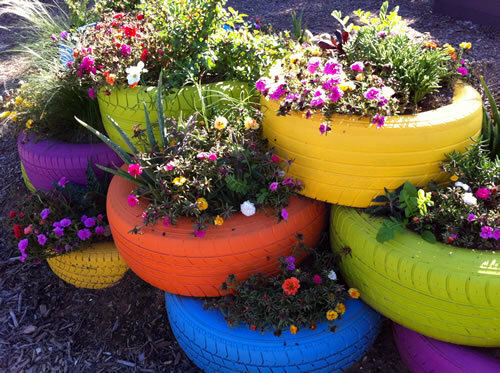 Have you created a tire garden? Do you have tips for our readers? Tell us in the comments below. One of my aunts used white painted tires as edging in her garden. She would’ve loved these more colorful ideas. Please give each picture taken credit to either artists or original websites like we do. I’m 64 years old and we had tire planters over 40 years ago. I never thought I’d see them back in style! I like the colored, wider tire planters. They would be nice used as a little vegetable gardens for tomatoes and peppers. You could place them inside a bed made of 2×8’s, fill in between tires with mulch or even nice stones. I’d paint the exposed area a fun color. OOPS. Never mind the veggies. Just finished reading more of the article and that would be a no-no. OK, back to planting flowers but I do like the bright colors. A word of caution on using the original tires stacked around and sitting on the ground….we did this a few years ago and the snakes loved them! I vowed I would NOT do that again. Now painting and stacking may be a different angle to the use of them, but one should always be careful where the finished product is sitting . I had tried tire gardening several years ago. Now I know that I did not water them enough. Like you I was trying potatoes but did not stack them. I did get several potatoes ( just used pieces of a sprouted potato in my sack of potatoes. I didn’t know.) knew we always planted potatoes in hills growing up but didn’t know to do it in the tires. I had planned on experimenting with the cardboard box container gardening you published not too long ago. Since I have four tires already here and one large truck tire this sounds like the idea way to go since I now know to water more frequently. I also have sturdy cardboard boxes on hand so I may try that too. I’m retired now and not as strong as I use to be so will have to just try to do what I can after I get some good dirt in. Interesting and informing articles on both ideas of containing gardening by the way. You do not need to fill all the tires. I would nail a board onto the bottom, or sit on a slab of cement,to keep out critters. Get a container with the wider rim, drop it into the top tire. Then you can have tomato plants or zucchini, etc growing in them, and draping over the sides; like they grow in a mound. As for flowers, I once had pansies in 1 level of tires. They overwintered in ice, never lost their blooms, nor color. Totally beautiful, and refreshed in spring. Great for Rhubarb…..want longer stalks, throw another tire on as they grow. My husband says we cannot use tires in the garden because he is worried about toxins from the tires getting into our food. Do you happen have information on this? We have a number of old tires but I’m now afraid to use them for anything except flowers. I’ve heard that one should not cultivate anything you plan to eat in old tires because of all the toxins found in the rubber. Are you aware of any studies on this? 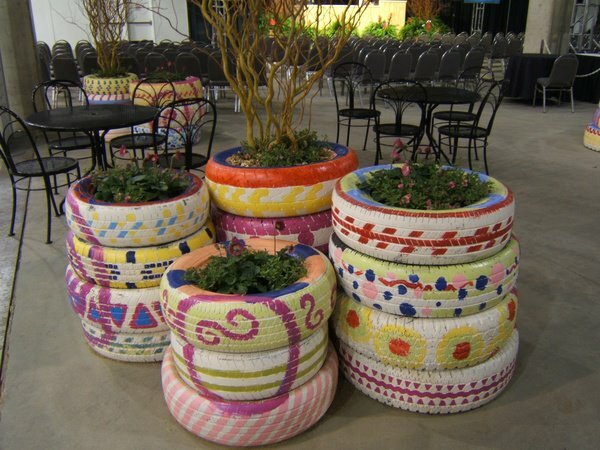 Love the DIY look of these tire gardens! Want to use them for sure, how about those toxins though for herbs???? this is such a cute idea! thanks! I have been obsessing over this too! I have my tires painted -but how to keep soil contained if tires are stacked? Just a thought but I would cut out rounds of plywood and sit each tire on the wood, don’t forget to drill a few holes for water drainage. We were planning on growing strawberries in old tires . Now I read about the toxins from the old tires , I wonder if they would be edible . Could someone let me know ? Great idea with the tires .but what about the toxins .????? Yes, I love the idea, but thought about snakes, how to keep the dirt from coming out, what about the toxins, and all of the above. The painted ones are fabulous… that is what attracted me to the idea! But the negatives bother me too. I can’t find anything as to proof that there is a danger of toxins. I’ve been using old tractor tires (huge tires) for over 20 years to grow my horseradish and some onions. We’ve never had a toxin problem. I also use tires around my tomato plants as we live in a cool area and the tires absorb the heat of day to keep the plants warmer at night. We’ve been doing this well over 40 years and never had a toxin problem. Just thought you’d like to hear from an old-timer. Help help help. We have tried painting a tyre in gloss paint – but over a week later it has not dried it is all tacky. Have a job to do with the tyres painted – can someone be more specific with what paint you actually used & how long it took to dry PLEASE. I am planning on painting some tires as well. My husband is a professional painting contractor and I asked him what kind of paint to get and he said any latex would probably work. Maybe you did you not use a latex paint? Prepare the tires; pressure wash or scrub w strong plain dish soap; dry in the sun for a day or two. Lightly spray the parts to be painted with auto primer from a car supply store; after that most paints will bond very well. How. Much paint per tire? Spray or brush? I gathered up 6 tires of different dimensions and have scrubbed them down with a natural degreasing solvent and purchased 6 cans of Rustoleum Painter’s Touch 2x Satin based spray paint which will adhere to plastic in 6 different bright colors for layer/stacking as pictured in the 3rd photo. I realize landscapting fabric or hefty thick trash bag should be put down under the bottom layer to keep the weeds down, then fill with dirt…..My question is this….in scatter stacking the 2d and third row, what should I put under the tires to hold the dirt in……the same….fabric or plastic and the walls of the tires will be over the walls of the tires underneath for stability and support or what? Im a bit lost and want to get moving on this SPRING project now that it is almost Fall! LOL Thanks for any assistance. So I wanted to use tires for a veggie gardens seams to be mixed information around about toxons …. I was told by a friend as long as it was not a root veggie so beans, tomatoes, strawberries are ok…. Old tyres used in the garden with a bit of imagination can go from an eyesore to a thing of beauty. Take a tractor tyre; lay it flat on the ground. Using a sharp knife (be careful) remove the upper side surface of the tyre. Next using a hole saw in your drill cut several 40 mm holes (that’s about a inch and a half) into the tyre thread edge, which is now (as the tyre is laid on the ground) the outer edge, stagger these holes around the tyre. Next paint the tyre with white paint. When dry place it in a garden site of your choosing. Fill it with river soil and a bit of straw. Now you can plant some nice flowers in the top of the tyre. In each hole you have made in the sides of the tyre push a new strawberry plant. When the flowers bloom and the strawberries grow you will have green leaves and the red strawberries contrasting against the white background of the tyre and the colours will be further enhanced by the flowers up top. I have a lot of old tires. Can’t cut them cause they have wire sides in them. I have grown tomatoes & peppers for years in them & all kind of flowers. they can be used to keep hillsides from falling further, Sure helps with weeding too. I love to paint, so I’ll try it. thanks. Do you spray the tyres or use a brush? looking for the chickens that were shown in the colored tires,stacked. ”’YOU”’ CAN CUT OLD TIRES. I called goodyear tire. JUST cut sidewall out of tire. RUBBER then cut with skill saw in circle cut. tree. Wider tires are perceived to be a harsher driving experience. It’s also a wise decision to never wait until it is too late to buy new tires.